Machine-driven outages at the factory are an expensive spanner in the works, so planned maintenance shutdown is critical in limiting machine glitches and production downtime. But in practice, equipment servicing isn’t always as frequently or regularly scheduled as desired. Why? Because planned servicing can be very resource taxing to the business. Turnaround maintenance is highly orchestrated endeavor, as different internal teams, third-party technicians and contractors work concurrently on multiple machines for diverse servicing. An incident at any point in the operation can significantly impact turnaround cost, speed and safety. Factory owners and operators will be pleased to know that machine maintenance just got easier. Panduit’s new VeriSafe absence of voltage tester (AVT) is bringing NFPA 70E-compliant automated testing and verification of energy discharge for lockout safety – to supersede the lengthy and complex manual tests – in as little as 10 seconds, and at no risk to the user. Manual testing is conducted on handheld tools, such as non-contact voltage tester for the first test, a digital, non-solenoid, electrical tester for the second test and a multi-meter with a low-impedance for live-dead-live test, and results can vary depending which tool the electrician chooses, his familiarity with its use, whether the tool is correctly used, and what is its state of maintenance and calibration as the time of use. VeriSafe however, is permanently mounted on the electrical enclosure of the machine and will consistently run the standardized test sequence when activated – which automatically verifies the phase conductor or circuit part for both phase-to-phase and phase-to-ground, as well as check for both AC and DC voltage as a standard. 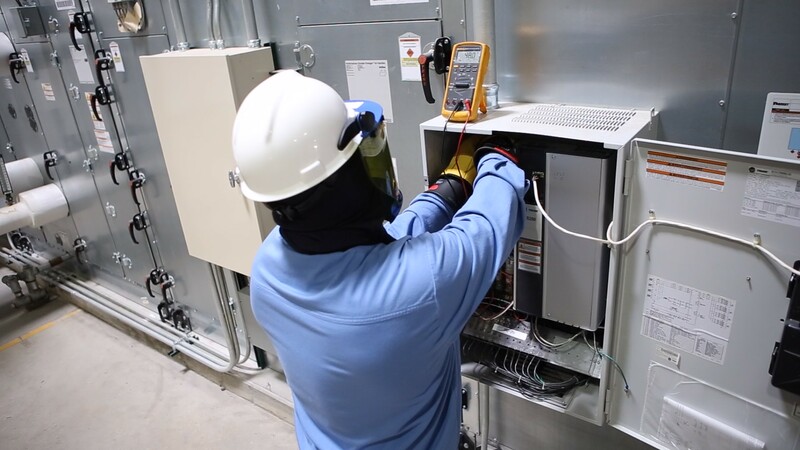 On the handheld process, the electrician can only know if energy discharge is successful after opening the electrical enclosure and going through the respective tests in exacting steps. But that means putting himself at risk of an arc flash upon opening of the enclosure, if the level of voltage present is still sufficiently high. VeriSafe has provisions to ensure direct contact with the circuit at time of testing, while preventing hazardous voltage from reaching the mounted surface by way of an isolation module. Because the push button sits at the outside of the enclosure, the user will not be exposed to electrical hazards when activating the process. It is cumbersome and time-consuming for electricians to test for absence of voltage in hard-to-reach enclosures, or in crowded or complex layouts that make using handhelds difficult. VeriSafe’s flexibility for different mounting and testing/detection applications makes it much easier to work in the tightest of spaces – which is also a significant advantage in shop floor design, as having more compliant options for placing capital assets means facility layout can be made more efficient. VeriSafe begins with a simple activation and ends with the green light to open the panel, as the middle steps are completely automated based on the recommendations of NFPA 70E. The problem with manual testing is the potential for errors that ranges the gamut, from human oversights and mistakes, to instrumentation fault, to possible missteps or omissions in the testing sequence, and more. Such is the over reliance on the electrician’s experience and skill to complete the job, which cannot be a comforting thought for the said worker, the maintenance staff, or the company. VeriSafe’s automated process and single step activation are standardized to avoid missteps in execution and sequence. It is further constructed to resist factors that could affect its accuracy and functionality – such as mechanical or electrical failures from wear, mechanical shock and environmental extremes.